In December 2010, at the age of 17, Half Pint became dull and depressed while keeping his box resting friend company and he began losing weight. 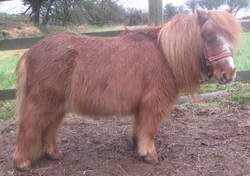 Several months on after the death of his friend and with a new Shetland for company I was still worried about him. He looked pot-bellied but with his spine and ribs clearly showing even with two feeds a day of Top Spec Antilam, Dengie HiFi Lite, unmollased beet and ad lib hay. I was turning him out with a grazing muzzle for two hours in the morning and two in the evening when the sugar in the grass should be at its lowest levels but he would frequently have raised digital pulses on coming in. He often had very loud gut noises which sounded like standing next to a drain! Also at times, he had a strange jerky nod of his head. 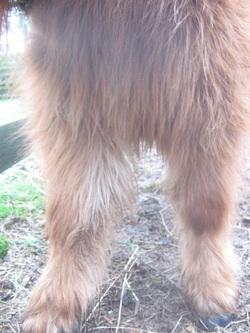 We'd had very cold winters the last two years and Half Pint had grown an amazing coat with a long goaty beard. The summer of 2011 he was very slow shedding his coat and it didn't really start until late August. When it did come out it was in patches. His sheath had started to get mucky too. Not knowing how much of his lethargy and depression and ill health could be due to the death of his friend, or a cause other than Cushing’ disease, because of the coat changes and loss of top line I put him on a trial dose of Vitex for a month. After about a week his eyes became brighter again and his depression and lethargy symptoms improved. I waited another month to be clear of the Vitex before asking my vet to do an ACTH test in October 2011, which I had read is a good time of the year to test. The results from Liphook showed ACTH levels of 127 pg/ml (reference range < 47 pg/ml) which they said was indicative of Cushing’s (his insulin and glucose were normal). Half Pint, who weighed 110 kg, was put on half a tablet (0.5 mg) of Prascend per day for a trial of six weeks before being retested. Luckily he didn't suffer the 'pergolide veil' and I soon saw more improvements in him. His energy levels increased and it's been brilliant to see him breaking into trots and canters again, better than he's been for years. He has been able to go out to grass more (still with his muzzle on) and now has a better covering over his ribs. I will still be careful to avoid turnout after frosts and on sunny spring and autumn days. I check his digital pulses frequently - mostly they are undetectable except for once just recently when I think he may have spent a little too long out in the field. Half Pint’s second test results (Jan 2012) showed ACTH levels at 37.8 pg/ml (reference range < 29 pg/ml). The vet has advised to keep Half Pint on 0.5 mg Prascend per day. 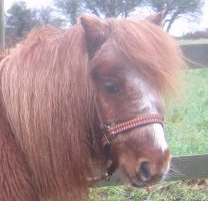 My fingers are crossed that by treating this disease in its early stages Half Pint will have many years of a good quality life that will give him the best chance of avoiding laminitis. Many thanks to Sally for sharing her experience.